I stayed there for two nights in a mix dorm. The location is perfect and near to the city center, 13 min walk from the bus/train station. Its good to stay there. This place is highly recommended for the visitors to stay. A perfect hostel for just a weekend in Stockholm. The beds where fine and we were lucky enough to have quite a quiet dorm. the only downfall is the bathrooms the toilets always smelled terrible and they had the smallest cubicles I have ever experienced. It’s kind of annoying that you can’t use their one hot plate past 6pm but all together a nice hostel. Washrooms/showers could do with a little more cleaning, remember flip flops! Codes are emailed to you for the front door, your door and the luggage room, making check in and out incredibly easy. Reception is only open for a certain amount of hours, meaning there are no staff present for the majority of the hours. Room was clean, sheets and towels were clean. Overall, for the price we paid compared to the other hostels in Stockholm, worth the price. Clean bed and a locker for your valuables, they have all that really matters I guess. I thought that the bathrooms were kind of gross sometimes, but nothing too out of the ordinary for hostels. It might have just been some of the people who were there while I was there. A little out of the way from the touristy stuff, but overall not a bad deal. I arrived late in the evening and left early in the morning, so there was no staff to welcome me, which felt a bit weird already. Luckily, we had the room number and code sent by email, so we could get in. You know that you're not paying much and that is also what you get - the rooms were okay but beds were not that great - especially mattresses. What disgusted me most were the bathrooms, showers and toilets in the same room and genderneutral. That is all not too bad, but it just wasn't clean. The staff were friendly enough to us but witnessing them interact with other guests, the customer service was lacking. We arrived quite late and got helped out and shown around which was appreciated. The bathrooms were very unclean and smelt like urine. There were bed bugs in my room and a girl had moved in the night to a different room as she was bitten. They refused to let another cancel for the following night as she was not bitten yet. Thankfully we had only booked one night. The guy at the reception was not nice and rude. The shower are not really clean. When we were there we can see that we were suppose to be able to use a heater to cook our food, but the reception close early so we can not use it. We didn’t have place to charge our phones because they are all at the same place and theirs not enough for everyone. 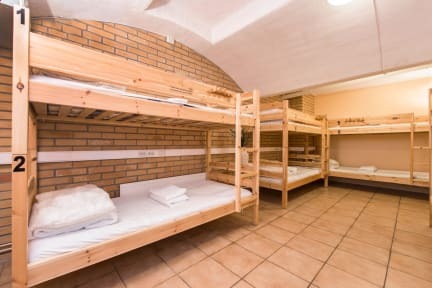 Bathrooms not really clean, you have to pay 60 sek for bed linen, common rooms are scarce and not comfy. Matress was no good either, would only recommend for a night, no longer.